255 State Street is a first-class office building ideally situated on Boston's waterfront, adjacent to the New England Aquarium and directly across from the open parks and green space created by the Rose Kennedy Greenway. 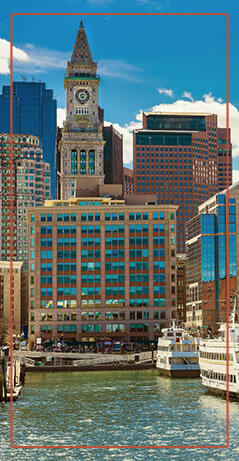 The 12 story, 220,000 square foot building offers breathtaking views of Boston Harbor. 255 State Street houses Legal Sea Foods and City Landing, two distinguished Boston restaurants which occupy the harbor and citysides respectively on the ground floor. In the summer months, these restaurants transform the historic brick sidewalks into outdoor cafés, where patrons enjoy the scenic waterfront and the bustle of Central Wharf. Building tenants on the floors enjoy expansive water and skyline views and are only minutes from many of Boston's finest attractions, including Faneuil Hall and Quincy Market, Boston's North End and waterfront neighborhoods, making 255 State Street a superior downtown location.